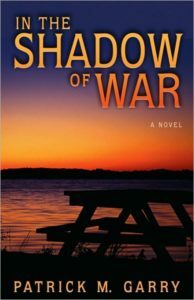 Patrick M Garry creates an emotive, microcosmic atmosphere against a backdrop of national conflict in his new book In the Shadow of War. In the Shadow of War centers on narrator Glen Kinsella, recalling his younger years. As the story opens, it is summer, 1970. Glen is a recent high school grad who grew up shepherding his mentally deficient brother Ricky, who recently died in a freak accident for which Glen feels responsible. Despite his special needs, Ricky was charming, with amusing speech patterns and a fascination with Martians that came from watching sci-fi movies. From his years with Ricky, Glen learned that contact with such people could bring out your meanness, your sense of playfulness and your deepest affection. Every year the two boys were dropped off by their parents in Corcoran, a tiny “blink-and-it’s-gone” town occupied by their Grandpa and a few other diehards who were trying to keep the town’s ambience alive. Ploughing the fields for meager crops and arranging an occasional burial in the Corcoran cemetery, Grandpa hits on the idea of reviving the town with new blood. He invites three women to move in: all are married to soldiers deployed in Vietnam, one of them, Sharon, already a widow. Glen, in his first summer without Ricky, is swept up in the lives and histories of these women and of the vets who occasionally come for picnics. But two visitors will change Corcoran – and Glen – forever: former soldier Will, who has dark news to impart, and Suzanne, a footloose young woman with a secret she feels she must hide, especially since she and Glen are falling in love. And around all of them, a sinister plot is underway for destruction of the town they all call home. Garry’s intriguing novel interweaves one boy’s coming-of-age drama with the memories, conversations and interactions of a gaggle of diverse characters. Glen’s recurring recollections of his time with Ricky provide a kind of playbook for his current exploration of the world of adulthood that he soon must enter. As the summer passes, the boy also learns more about Grandpa’s deep attachment to Corcoran. The potent framing for this elaborate interpersonal tapestry is the Vietnam War. Protests against the war are mounting, and protestors come to Corcoran, affecting and afflicting its newfound collection of war wives, widows and survivors. Quill says: Garry has created a memorable snapshot of a divisive era in our nation’s history, revealed through the eyes of realistically conceived characters who, no matter the outcome, have much to gain or lose.